To assess the suitability of proposed building(s) for erection in the village. To scrutinise all planning applications received from the Borough Council within the time limit set by the Council. To assess the suitability of the proposed building(s) for erection, or alteration of existing buildings, in the village and inform the Borough Council of the result of the assessment. The Clerk is to send Members of the Working Party copies of the letter covering the proposal and to inform them who has the plans. If comments are required before the next meeting ~ see below ~ it is the members responsibility to give their views to the Clerk by the due time. In carrying out this assessment the proposal is to be looked at from the aspect of the village as a whole and not from an individual point of view. The impact of the proposal on the surroundings. Whether the proposal constitutes ‘over-development’ of the site. 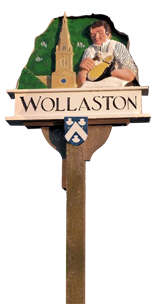 To ensure the proposal is in line with the Wollaston Neighbourhood Plan. Whether the proposal is in keeping with its surroundings. The road and traffic safety aspect of the entrance/exit. The reaction of the village as a whole rather than just neighbours. The amount of parking space in the proposal. In cases where there is concern, these concerns are to be discussed by the Parish Council as a whole before commenting to the Borough Council. N.B. The exception to this is when there is insufficient time for the proposal to wait to be discussed at the next Council meeting. I.e. those proposals received during the week following a Council meeting. In these instances the Working Party’s comments will be forwarded to the Borough Council and the Parish Council informed at their next meeting. The Clerk is responsible for collating the views of the Working Party/Council and forwarding them to the Borough Council. Composition - a minimum of seven Councillors, one of whom shall be the Chairman of the Parish Council. For current composition see Planning Working Party.